What Hi-Fi magazine June 2010	"Up and running, the A9's bass is taut and agile, perhaps trading sheer quantity for the ability to track a fast moving bassline with precision... Notes are tightly defined with no overhang, while bass textures are beautifully described." "Move up the frequency range and these speakers continue to impress. Voices display intimacy and insight, while high frequency detail comes through with pristine clarity, much bite and lacks nothing for refinement. There's an impressive amount of communication and an unswerving ability to reveal the inner workings of a recording." 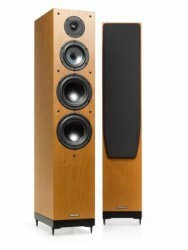 "Pleasingly, however, the A9 hasn't lost the naturalness of past Spendor models, and it's that quality, more than any other, that separates this floorstander from its rivals." "Amazingly clean and transparent sound, agility and seamless integration." highest order." The Spendor A-Line are compact high performance floor standing loudspeakers with smart styling and natural veneer finishes. Each model benefits from important advances in Spendor's drive unit technology, cabinet design and crossover engineering. 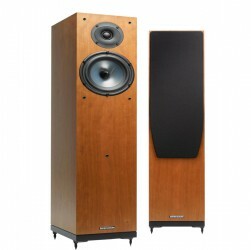 The fourth generation Spendor 'linear flow' port gives the A Line unrivalled ability to deliver deep articulate bass. Spendors Dynamic Damping system uses constrained polymer dampers at key energy interface points, converting spurious energy in into inaudible heat for a naturally fast, engaging sound. The new steel stabiliser disk system eliminates flexure at the plinth and contributes to the neat appearance and good stability of these slim cabinets. Clean modern styling blends confidently with any decor.